Please read the latest School Travel News (link below) featuring our journey through the MODESHIFT STARS awards Scheme (Sustainable Travel Acceditation and Recognition Scheme). We have been working hard on our school travel plan to ensure children's safety and promote safer and healthier ways to travel to school at the start and end of the school day. Parking on the pavement can obstruct and seriously inconvenience pedestrians, people in wheelchairs or with visual impairments and people with prams or pushchairs. Please adhere to this guidance. Here are some of the latest plans to help ease congestion in the local community during peak school hours. 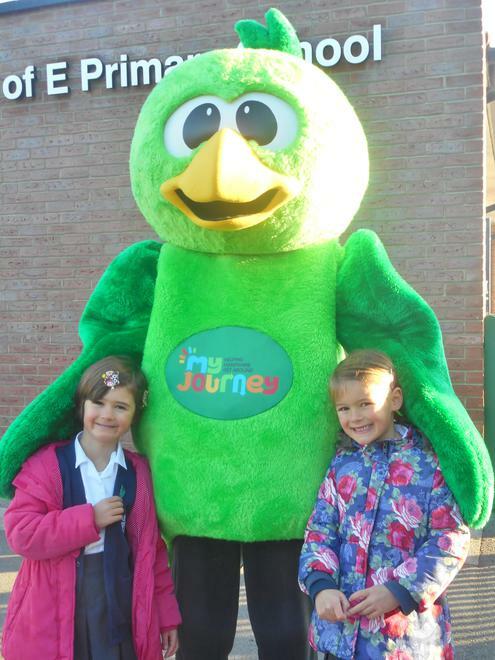 In October, we took part in a 'Walktober' Event and a number of children took part by walking from the Jubilee Field to the school and were greeted by Basil Bird. Through events like these and reminders regularly featured in Parent Newsletters, we encourage parents and carers to help make our school run safer and healthier by joining the families who are already walking, scooting and cycling to school every day. We have lots of cycling storage; cycling/walking makes a really healthy start to the day, cuts down on congestion outside of the school and improves the air quality. In particular, we really want to reduce the numbers of cars on Westbeams and Church Lane. We have also introduced a new Park and Stride scheme. Please see below the link to our new park and stride map. We are asking all families to make use of the park and stride facilities at the Jubilee Fields, the Manor at Sway and outside Janet Kirk Floral Designs, in front of the Forest Heath Flats. We thank the Parish Council, local businesses, the Manor at Sway and Janet Kirk Floral Designs for fully supporting this scheme. Drivers: If you must drive to school, please make use of one of the designated ‘Park and Stride’ car parks and walk from there. This will make the journey to and from school so much safer for everyone. Lots of car parking space is available at the Jubilee Field car park, 6 spaces are available at the Manor at Sway and 3 spaces are available outside Forest Heath House. Please note , that if you would like to make use of the spaces available at both the Forest Heath Flats and the Manor at Sway, a parking permit (available from the school office) will be required. These will be issued on a first come first served basis. NEVER park on, or opposite, the zig zag markings or on yellow lines, speed humps, near junctions and driveways or reverse into spaces if you can’t see clearly behind you – there might be a child. My Journey kindly donated some bright, ‘be safe’ clothing and accessories; our Junior Road Safety Officers raised £20.00 selling these items and this will go towards the cost to extend our current bike shed facilities. Well done!